Do you always encounter a situation when you need to convert a document into PDF? Well I am sure its common because the most common document format in use today is PDF. However, a full function PDF creation software can be expensive. Who would spend that much dough for applications like that? Unless the company I am working is paying for it, I am 100% sure that I wont. Well, I guess today is our lucky day. Some good-hearted software developer decided to spread the love of free PDF. 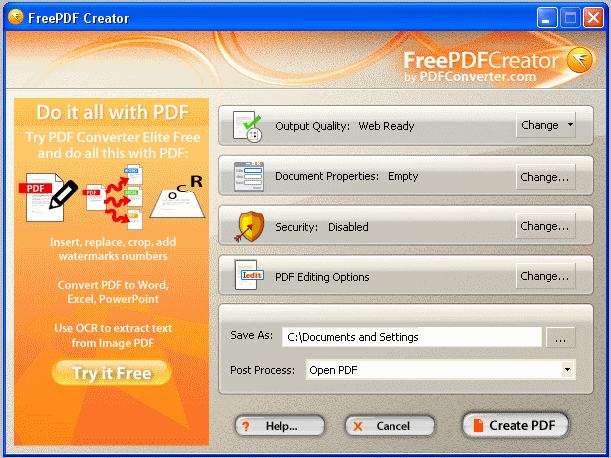 Free PDF Creator as the name implies, is a free Pdf creation application. Once installed, it acts like “virtual printer” so you can use it directly from your application of choice. If you want to create a PDF document from an Office application like Word, just click PRINT, select “PDF Creator” as your printer and then hit PRINT. Save the output document into any location you want and voila! You have a PDF document. It currently supports Windows only at this time but hopefully they will expand it to other OSes in the future. Are You Looking For an iPhone Case That Can Get You In Rhythm (I Mean Your Heart Rhythm)? Do We Really Need an “UP” to be Up? Do I really Need a Portable Scanner? Will Microsoft’s Surface Pro Scratch The Surface of Computing Public’s Attention? ← Did You Know That Breast Cancer Cells Can Also Give In To “Peer Pressure”?